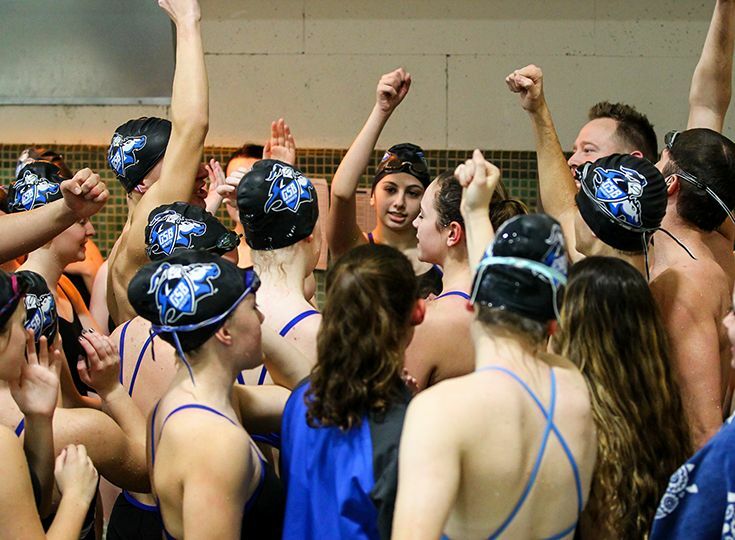 For the first time in program history, the boys’ and girls’ swim teams had multiple swimmers and relays receive all-conference honors for their performances this past winter. Leading the way for the Knights was Rebecca Michaels ’20 as she claimed her third-straight 1st Team selection in the 500 freestyle (5:26.40). Joining her for the first time was Maddie Soultanian ’22 who was named 1st Team in the 100 freestyle (58.78). Michaels and Soultanian teamed up with Laura Howard ’21 and Olivia Soultanian ’22 to be named 2nd Team in the 200 (1:50.38) and 400 (3:59.54) freestyle relays. On the boys’ side, the 400 freestyle relay of Christian Ernst ’19, Gabe Myler ’19, Preston Reep ’19 and Robert Brandl ’20 were named 2nd Team in the 400 freestyle relay (3:43.69). Also receiving Honorable Mentions were Jonathan Osma ’20 and Ella Quincy ’22.